Dr. Bronners is an old company that is making family soaps since 1858. With this long lasting tradition, we expect that they create amazing natural toothpaste. 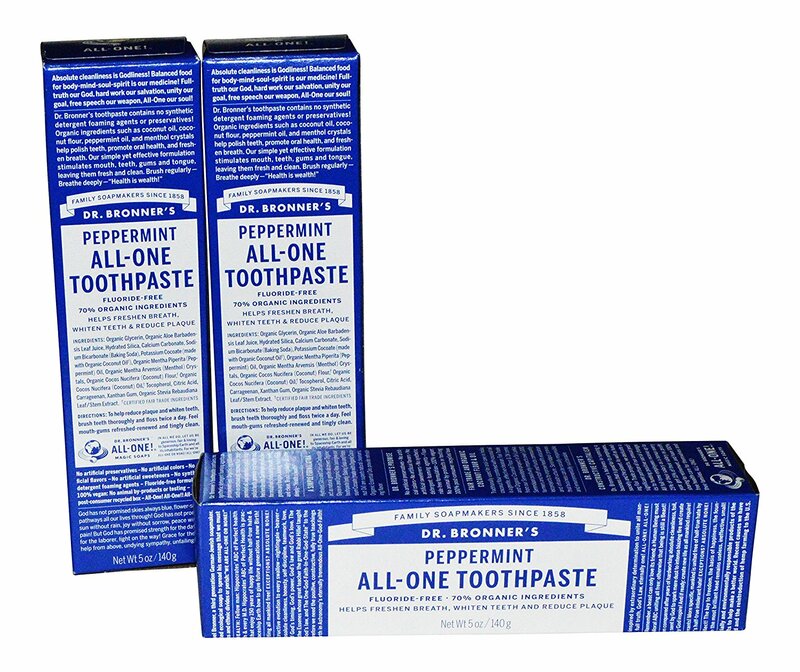 Dr. Bronners Toothpaste with spearmint will for sure makes your teeth clean, fresh and white. Toothpaste formula contains many different ingredients. Some of these ingredients we never see before in toothpaste. Dr. Bronners claims that their toothpaste is made 70% of organic compounds. And not only it is 70% organic, but it is also free from fluoride. There is no artificial colors, sweeteners or preservatives in this toothpaste. As well Dr. Bronner’s toothpaste is vegan-friendly because no animal was hurt or used in the process of making this toothpaste. Coconut is one of an essential ingredient for this toothpaste. Potassium Cocoate – Derived from coconut. It is a natural surfactant that will make your teeth clean. This substance is not edible, but in small dosages, it will not harm you. Make sure it does not get in your eyes because it may make your eyes itchy. So if you get in your eyes just wash it with clean water. Organic Cocos Nucifera Oil – Also derived from coconut. This oil is edible and will not make any problems in your mouth. Organic Cocos Nucifera Flour – Same as oil, it is derived from coconut, but this is in powder form. Coconut may be the most important ingredient of this toothpaste, but there are many other good parts. Ingredients like Calcium Carbonate, Sodium Bicarbonate, Organic Aloe Barbadensis Leaf Juice, Organic Mentha Piperita Oil, Organic Mentha Arvensis Crystals, Tocopherol (Vitamin E), Citric Acid, Carrageenan, Xanthan Gum, Organic Stevia Rebaudiana Extract, Organic Glycerin, Hydrated Silica. Many nice ingredients, but as well you already recognize a few controversial. Carrageenan, Xanthan Gum and Citric Acid. As well we are not too happy to see glycerin and silica in toothpaste. But ok, with silica we may make peace and maybe with glycerin too. But Carrageenan who is linked to cancer by some studies if it is degraded Carrageenan. And since on Dr. Bronner’s ingredients list does not say what kind of Carrageenan they use we may not know. Citric Acid is a well-known allergen that is far from natural ingredient. Just to make clear, there is nothing wrong with Citric Acid, but why to use it in toothpaste? Not that it will help in your teeth cleaning or anything. And in my humble opinion, I just think it can do more damage to the teeth than good. Xanthan Gum is a food additive. Now I won’t go to debate if it is natural or synthetic additive, but it is additive. And people with digestive problems should avoid products with Xanthan Gum. Okay, this is toothpaste, so you probably won’t eat it, and there should not be any problems, but better stay on the safe side. At least try not to give toothpaste with Xanthan Gum to your kids because you never know when they will swallow. There are some question marks, and some ingredients are not clear enough. But overall I think in this toothpaste there is more good than bad. Carrageenan and Xanthan Gum may be components you should avoid, but there are so many healthy ingredients that will make your teeth cleaner, whiter and stronger. If you do buy this product, then I advise you, not to swallow when you brush your teeth, just to stay on the safe side of the page.